An impressive collection of skeletal specimens. Hands on with drawer pull outs. A great place for young dinosaur and or rock enthusiasts! The origins of the Amherst College Museum date back to the very earliest days of Amherst College. The College itself began in 1821 as a teaching institution primarily for missionaries that would be stationed worldwide. From the beginning, science was a vital part of the curriculum. You can read about the history of the geology department here. Perhaps the most significant event to affect scientific study and research at Amherst College was the addition of Edward Hitchcock as Professor of Natural History and Chemistry in 1825. Hitchcock had wide-ranging interests, a keen sense of scientific investigation and the dynamic energy to execute numerous scientific investigations and ensuing publications. He also encouraged alumni to send back scientific specimens from all over the world and himself collected geologic and fossil specimens from local sites. One of these collections, the Hitchcock Ichnology Collection (ichnology is the study of tracks and traces), today continues to be the largest fossil track collection in the world and one of the most studied. The Amherst College Museum’s Vertebrate Paleontology Collection is the third most outstanding in New England (after the Yale Peabody Museum and the Harvard University Natural History Museum). 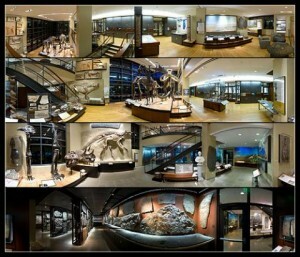 It consists of over 22,000 specimens, including 85 types (the first-discovered specimen of a fossil species). A strong science curriculum from the College’s beginnings in the 1820s has been a key factor in developing the strength of the Collection which today includes representatives of all the major groups, while strongest in Cenozoic South and North American mammals. A number of people contributed to this collection since the mid 1800s. Some specimens were acquired through purchases from European supply houses popular in the 19th century; many others were acquired from field expeditions and donations. Fossils from such well-known sites such as the Burgess Shale in Canada and the Solnhofen limestone in Germany enhance the research value of this collection. All of the major invertebrate groups, from the Precambrian to the Recent, are represented in a collection numbering about 80,000 specimens, eight of which are types (first-discovered specimens of a fossil species). The mineralogy collection consists of approximately 4,300 cataloged specimens, with over 9,700 objects. Representing about 800 mineral species from more than 50 countries, the collection is strongest in minerals derived from classic European and U.S. localities. The collection is arranged according to the old Dana classification system. Somewhat unusual amongst the holdings of the BMNHAC, this collection was amassed primarily through trade and purchase rather than expeditionary collecting by individuals associated with the College. Contributors include noted dealers such as Albert Edward Foote, August Krantz, George Frederick Kunz, Lazard Cahn, B. Sturtz, and Ward’s Natural Science. Private collectors include Walter Frederick Ferrier, S. Denton and Edward Burroughs Underhill. Collectors/donors associated with Amherst College include Francis Richmond Allen, George W. Bain, William Phipps Blake, Gerald P. Brophy, Julius W. Eggleston, Benjamin Kendall Emerson, Clarence W. Fearing, Carl A. Francis, Edward Hitchcock, and Charles Upham Shepard. As it happens, the current mineralogy collection is not the first one to have been acquired by the College. 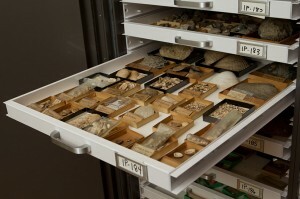 The original collection—thought to be one of the best of its contemporaries—had been assembled by Amherst geology professor Charles Upham Shepard (1804-1886) throughout more than 40 years of collection, exchange and curation. Regrettably, nearly all of the 25,000 specimens were destroyed when the building that housed it, Walker Hall, was leveled by a fire in 1882. The mineralogical curator at the time, Professor Benjamin Kendall Emerson (1843-1932), soon began the work of reassembling the collection. The collection was used for both teaching and display in the 19th and 20th centuries, but is now used primarily for display purposes. ← The dining room is priceless!